Hi guys, this is a Guide on Elemental Lord/Elementalist Skill Build I’ve written based on several guides from foreign players. I am not an experienced Elemental Lord/Elementalist, and hence you may wish to refer to other guides before following my skill build entirely for yourself. I will be using a Hybrid Fire+Ice skill build (leaning towards Ice). Please note that this skill build may change drastically when the 2nd job advancement is being released. This build is only dedicated to hybrid builds up to Lv40. I have used up all the available SPs as this is the build I will be following. Gives you a taste of playing both Ice and Fire Elemental Lords, to determine your choice of the 2nd job advancement. Low damage of skills, plus low debuffing effects. MP usage can be quite high. Take note that the English names of the skills are taken reference from mmosite, hence the names may contradict what we have in Dragon Nest SEA. Here’s the link in which you can compare the name to the skill icons. I will update this once the information is being released in Open Beta. Link here MMOsite Sorceress Skill List. Now let’s take a look at the build. If you want to create your own build, you can go to the simulator at the Resources Tab of this blog. Flame Worm and Whirling Staff/Wheeling Staff – Left at pre-requisite will do. Won’t be using them at all at high levels. Glacial Spike – Low cooldown skill with low damage. Great skill for Ice Elemental Lords. Max this, or max Poison Missle. Poison Missle – A must-max skill for high DPS, but only for Fire Elemental Lords. For Ice Elemental Lords, you can choose this, or either to max Glacial Spike. Force Explosion/Void Blast – Skill with OK damage. Some Elemental Lords added this for PvP. In my opinion, this is a little useless. Don’t add this at all. Shock Wave – Skill with OK damage which helps to knock mobs away from you. A great skill to break defenses, like mobs with shields, or players casting skills which are easily interrupted. A skill with good potential growth, may be worth adding high. Charge Missle – I didn’t learn this skill because I won’t be able to hold my attack button to do spam normal attacks. I usually spam normal attacks when skills have not finished their cool down so I can continue my combo count. If you learn this skill, it may affect your combo count. Blink – Max it for lower cool down. So that you can avoid mob damage better. Counter Spell – Must-learn skill to recover after being knockdown-ed. Aerial Evasion – Must-learn skill to recover after being thrown in the air. Escape – Excellent skill to recover your movement. When being attacked and rendered unmovable, you can use blink to escape away. Mental Mastery – Learnt till the level to unlock Mental Training. You can ignore this skill if you have an abundance of Mana. Mental Training – If your Mana regenerates fast enough, ignore this skill as well. Otherwise, leave it at lv 1. Physical Mastery – Maxed at lv 3 in this case. You may want to drop it also if you have sufficient HP when using Set Equipments. Fireball – Even at Lv1, the damage is incredible, no matter if it’s for PvP or PvE. A must-max for Fire Elemental Lords. For Ice Lords, at least pre-requisite/Lv1. Glacial Wave – Despite being a small AOE skill, it has superb defense breaking capabilities with a fast casting time. At high levels, it can freeze enemies for a good duration for Elemental Lords to chain their skill combos. Recommended to level as high as possible for Ice Elemental Lords. Inferno – Another skill with good damage, but the downside is that you cannot move in the time of casting unless you Blink. Pre-requisite, or level it high if you have sufficient SPs. Lv7 gives additional range. Freezing Field – A decent range skill with decent AOE, but a slightly long casting time. Mainly used to slow enemies and reduce their Ice-Based defense. At least pre-requisite, or level it high for higher debuffing effects. Fire Wall – A decent-to-short range skill with decent AOE, but a slightly long casting time. However, it’s a good skill to defend yourself against surrounding enemies, and even lifting them into the air for air combos. At least pre-requisite, or level it high. Fire Bird – An instant cast skill with decent damage. A good skill to implement the burning effect on enemies. Pre-requisite, or level it high. Freezing Sword/Icy Shards – A normal damage skill, primarily used for debuffing Ice-Based defense, and lifting enemies into the air. At least pre-requisite, or level it high if you are an Ice Elemental Lord (For 2nd job). Ice Stab/Frozen Spikes – An Ice-Version of Force User’s Microhole. An instant cast skill, that leaves ice spikes on the floor to deal continuous damage for up to 6 hits. Good for debuffing enemies. Flame Road – A very good damage skill that allows you to use it for approaching or escaping enemies. At least Lv1 or max it. Ignition – Ignites enemies with burning effects for a superb damage dealt. However, the burning effect will be removed after this skill is successfully casted. At least Lv1, not recommended to max unless you have enough SPs. Icy Fraction – Deals a great deal of damage to enemies being frozen, or being debuffed with an ice effect. After the skill is being successfully casted, the slow effect remains. At least Lv1, not recommended to max unless you have enough SPs. Chilling Mist – This skill may not have damage as high as Flame Road, but for skills that are being casted instantly, this is definitely one of the best of them. Slowing effect and Ice-Based defense reduction are increased as the skill level is increased. At least pre-requisite, or level it as high as possible. Flame Spark – Some Elemental Lords suggest only Lv1 is sufficient, but others added it high for increased AOE and damage. In my opinion, Lv1 will do. Frost Wind – Great skill for slowing enemies, especially when it is being levelled high. At least Lv1, recommended to level it high for Ice Elemental Lords. Fire Shield – At least pre-requisite. Freezing Shield – At least pre-requisite. Payback Mana – Don’t think it’s useful, in my opinion. Flame Vortex/ Blizzard Storm – Pick one of them, depending which job you will be choosing for the 2nd advancement. Flame Vortex is a great AOE skill dealt in front of the player, while Blizzard Storm deals great AOE damage around the player. Please note that some of the skills that I have suggested to add, may be removed once you reach 2nd job. When 2nd job comes, it will be the time for you to decide which skills to be sacrificed and add other skills high. If not, you will be dealing very low damage on the higher level dungeons. MP usage will also be a very serious issue. That’s all for now. Any comments or suggestions? 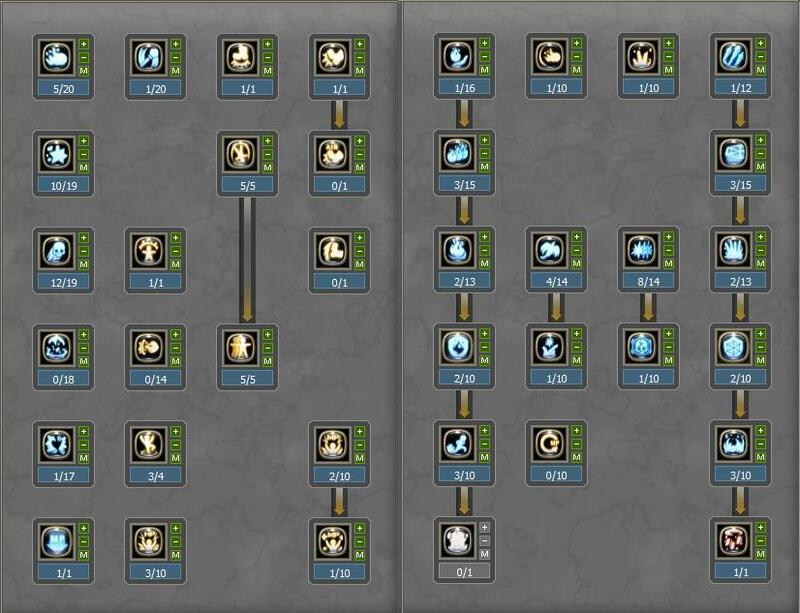 Posted on July 26, 2011, in Elemental Lord/Elementalist and tagged Build, Dragon Nest, Elemental Lord/Elementalist, Elementalist, Skill Guide. Bookmark the permalink. Leave a comment.